The President of Singapore, Dr Tony Tan Keng Yam, has awarded Singapore's highest honour for scientists to the President of Nanyang Technological University (NTU Singapore), Professor Bertil Andersson, for his contributions to scientific research and development in the country, and for his contributions in transforming NTU Singapore into a world-class institution in the last decade. Professor Andersson, a Swedish citizen, received the President's Science and Technology Medal at a ceremony this evening (18 October) at the Istana, the official residence of the Singapore President. 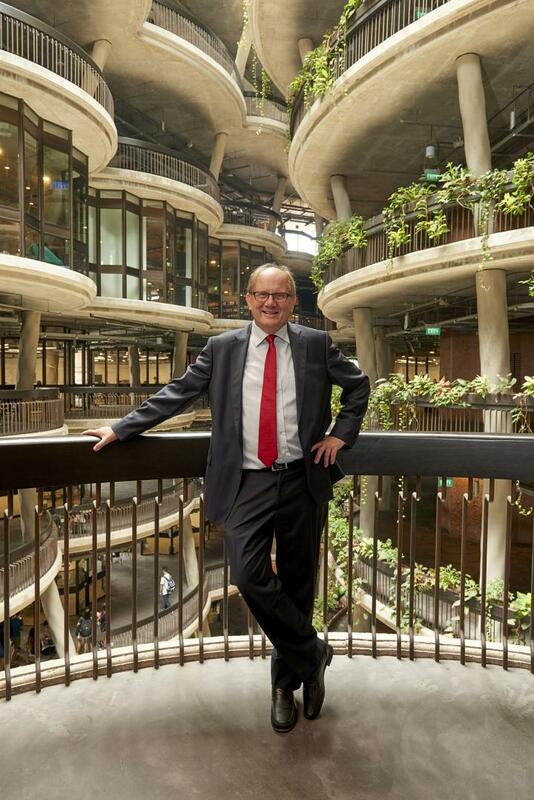 Professor Andersson has worked in Singapore since 2007, when he joined NTU Singapore as its Provost. Since then he has launched pioneering schemes to attract the best young researchers to Singapore and to the university and played a leading role in creating Singapore's newest medical school jointly with Imperial College London. He and his team also attracted top industrial collaborators to the country to set up research and education partnerships, including a S$75 million (US$55 million) corporate lab with Rolls Royce, anchoring the company in Singapore. He was appointed NTU Singapore's President in 2011. Just 25 years old, NTU Singapore is ranked as the world's top young university and placed 13th overall for the second year running in the 2016 QS World University Rankings. Professor Andersson said: "It is a great honour and privilege to receive this prestigious award. It is particularly meaningful to me, an 'adopted' Singaporean who was welcomed here and entrusted with so many important projects for the country. I have always felt appreciated in Singapore and have never been made to feel like an outsider or alien in this cosmopolitan city. "This award is a recognition that I share with the NTU Board of Trustees and the NTU team for their solid support, working hard together with me to transform the university into a world-class institution, recognised for its excellence in education and research. The work is not done yet, as there are new peaks to conquer and new challenges to face. But we are on the right track and I believe NTU will continue to play a major role in the spectacular Singapore success story." Inaugurated in 1991, NTU Singapore marks its silver jubilee in 2016. Professor Andersson who has worked in different countries promoted a global mind-set at the university which has a goal of having at least 80% of its undergraduates go overseas at least once during their studies. He also set up the Nanyang Assistant Professorship scheme to attract a new generation of outstanding young investigators from around the world to NTU. He has championed the large-scale adoption of the 'flipped classroom' learning model across the university, with S$75 million (US$55 million) invested into redesigning at least half of its current 3000 modules for flipped classroom learning. Under his leadership an iconic learning hub known as The Hive was opened last year. NTU Singapore's faculty are drawn from over 80 countries and it has a strong network of international industry partners in research, ranging from Rolls Royce, BMW, BAE Systems, Robert Bosch GmbH, Leonardo-Finmeccanica in Europe, General Electric and Lockheed Martin in the US, and Delta Electronics, Hyundai Engineering & Construction and Toray in Asia. In April 2016, NTU was named Singapore's top institution in research for the second consecutive year in the Nature Index global rankings. NTU Singapore was also ranked 32nd among the world's universities and 37th among global research institutions. NTU Singapore takes the lead in normalised citation impact among Asia's top universities. According to QS, NTU Singapore is one of only six institutions in the world in the top 100 across all six QS World University Rankings indicators, together with MIT, Cambridge, Oxford, UCL and Imperial College. Professor Bertil Andersson is a world-renowned plant biochemist from Sweden with a longstanding association with the Nobel Foundation. He has pioneered research on the artificial leaf, a promising area of sustainable energy research that uses sunlight to produce clean, low-cost sources of energy, and is the author of more than 300 papers covering topics ranging from photosynthesis research and biological membranes to light stress in plants. He received the Wilhelm Exner Medal from Austria in 2010. Prof Andersson was installed as NTU's third President on 1 July 2011, after becoming NTU's Provost in 2007. Prior to that he was Chief Executive of the European Science Foundation in Strasbourg, France, from 2004-2007 where he helped to consolidate research efforts across 30 European countries. He was formerly President of Linköping University, Sweden, from 1999 to 2003, and from 1989 to 1997, he was member of the Nobel Committee for Chemistry (Chair 1997), subsequently becoming a member of the Nobel Foundation (2000-2006) and he is currently a member of the Board of Trustees of the Nobel Foundation. Prof Andersson has served on the boards of several Swedish and international foundations and learned societies, including the Royal Swedish Academy of Sciences, European Molecular Biology Organisation, Australian Academy of Science, Academia Europaea, Royal Swedish Academy of Engineering Sciences, the Swedish Foundation for International Cooperation in Research and Higher Education, and Austrian Academy of Sciences. He is a research adviser to the Swedish government and was previously Vice President of the European Research Advisory Board of the European Commission in Brussels. He has also been an adviser to business activities in the biotechnology and pharmaceuticals sector. In Singapore, he serves on the Governing Board of the Singapore Centre on Environmental Life Sciences Engineering, and is a Board member of A*STAR Singapore, the government agency in charge of national scientific research and development. Prof Andersson received his BSc and MSc at Umeå University, Sweden, before completing his PhD and DSc at Lund University, Sweden. Continuing his teaching and research duties at Stockholm University in 1986, Prof Andersson served first as Head of the Department of Biochemistry, then as Dean of the Faculty of Chemical Sciences from 1996 to 1999. He continues to hold academic appointments as Professor of Biochemistry at Linköping University and Adjunct Professor at Umeå University. He is also a visiting Professor and a Fellow of Imperial College London. He has received more than 13 honorary doctorates from universities including Tianjin University, University of Edinburgh, University of New South Wales, Hebrew University of Jerusalem and Hanyang University.